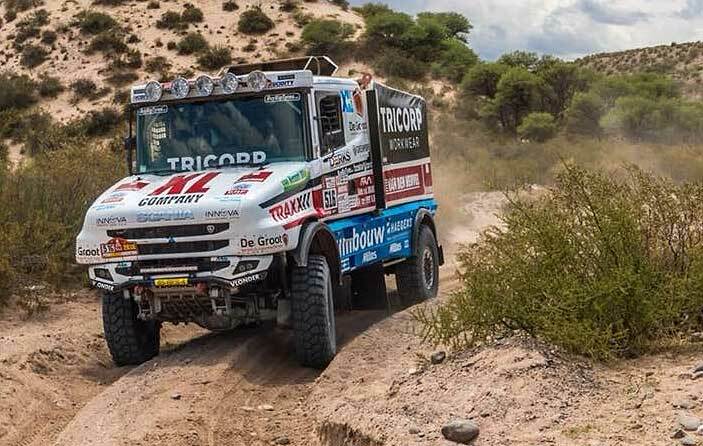 In the international rallyraid-sport there are only two truck-teams competing with Swedish Scania Trucks: The team Kovacs from Hungary (started at the Africa Eco Race) and the Dutch team "Dakar Speed". Dakar Speed is actually fighting in the Dakar 2018 - and this inside the top ten! Their Scania "Torpedo" with 9,380 kg is competing in the light-class trucks (like the Japanese Hino), powered by a Scania XPI 13-liters engine with 4700 Nm. The truck was rebuilt for the Dakar 2018: "Our challenge is to achieve maximum performance in the toughest rally in the world." With the 10th position overall the team of Maurik van den Heuvel, Wilko van Oort and Martijn avn Rooij is showing a great performance. Driver and Team-Boss Van den Heuvel started his Dakar career in 2014, since then he was competing every year. In his private life he is owner of the Dutch logistics-company "Van den Heuvel". In SS12 the team finished 7th: "Wow, this was a real test, I´m really broken," said Van den Heuvel after the stage. "We were running well but had a problem after 10 kilometers when we passed a river and one plug went wet. We lost 12 minutes to dry the plug. The rest of the stage was ok and I was driving more secure because we want to reach the finish on Saturday."